This U.S. Geological Survey map, Central United States Earthquakes, displays earthquakes that have occurred in the central United States between 1974 and 1991. 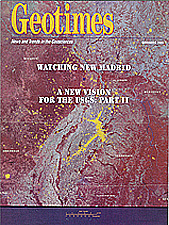 The epicenters are shown on a map base obtained from Landsat satellite imagery of the New Madrid Seismic Zone and surrounding area. Epicenter symbol sizes are scaled as magnitudes 1.5–2.0, 2.0–3.0, 3.0–4.0 and greater than 4.0. The map is available from the USGS National Earthquake Information Center in Golden, CO. (<http://wwwneic.cr.usgs.gov/>). Product ID Number: 0607845562. Courtesy USGS. Geoscientists in a Changing World: Where Do We Stand? In this second part of an interview with the American Geological Institute, U.S. Geological Survey Director Charles G. Groat speaks candidly about the survey’s budget, culture, science and future. The central United States doesn't experience the frequency of large earthquakes common for the West coast. But the country's center has a history of damaging quakes, and researchers are still determining how often the largest quakes could occur. Given the region's unpredictability, seismologists and geologists from universities and state surveys have created consortia and seismic networks to keep a constant vigil on mid-America. Here the leaders of one such group describe their mission.